As the air gets colder I find myself reaching for cozy sweaters and boots. I adore the jeweled collar on this sweater from J. Crew. It's just enough embellishment to make things interesting while not being over the top. It would pair nicely with a simple skirt with a bit of texture to it like this marled skirt from Madewell. 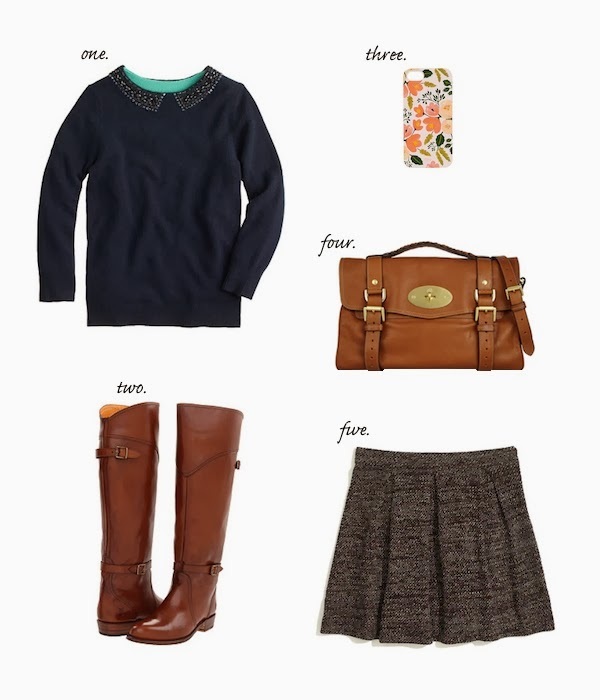 Add a pair of classic riding boots and a carry all bag and you're good to go. And even though it's Autumn, I can't get enough of this sweet floral phone case. OMG I love love those boots, that bag and that skirt!! Beautiful outfit. love the boots and phone case!